Everyone knows what a business pitch competition is. But what about a “reverse pitch”? BTV Ignite – a local non-profit created to leverage Burlington’s world-class fiber optic gigabit network – just held one of those at UVM’s Larner College of Medicine on May 4. A reverse pitch turns the standard event on its head by asking entrepreneurs to do the listening, while people who could be their customers do the pitching -- by talking about the challenges they face that innovative new products could address. BTV Ignite’s event centered on education and featured a group of educators, some from UVM’s Tarrant Institute for Innovative Education, who outlined the challenges teachers are encountering in the classroom today, and a group of about 25 app developers, who hoped to address their issues with new technology. Later in the summer, two winning developers will be awarded $10,000 each to further refine their app ideas. 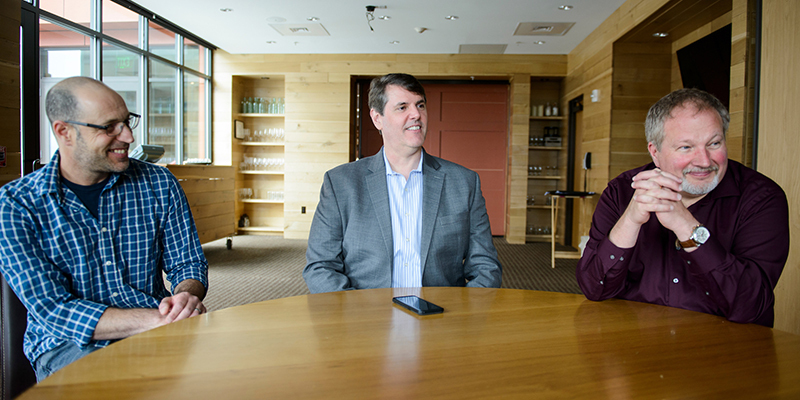 A few hours before the reverse pitch, UVM Today had a wide-ranging conversation with two experts brought in to provide national context for the event – Miki Yarkoni, director of business planning for Microsoft’s cloud and artificial intelligence group, and Scott Turnbull, national technology leader for U.S. Ignite, a National Science Foundation initiative that is BTV Ignite’s parent organization. Also joining the conversation was Dennis Moynihan, executive director of BTV Ignite. The conversation covered the coming golden age of tech, Burlington’s role in the future of technology development and the dramatic effect technology will have on education. UVM Today: We hear a lot about how technology is on the cusp of transforming life as we know it. Integrating artificial intelligence and the Internet of Things will be a big part of this new world, right? Scott: If AI is the artificial mind, then IoT – which means that all kinds of common devices will be connected to the internet and can be controlled through the network – is the artificial body. It’s the ears and eyes and the fingers to flip switches and turn things on. That extends AI to being a useful interactive environment. Miki: Once those technologies are fully integrated, you’ll have ambient assistance, always listening, always ready to help. When you say "I'm cold,” your Google Home or Alexa or Siri will adjust the temperature. When you're out, the small earbud you're wearing will confirm the time of your doctor’s appointment, call an Uber to get you there, and schedule a business call for the ride back. Dennis: The world around you will know what’s going on and then is able to help you. It’s really a remarkable opportunity. UVM Today: This new order seems to be perpetually around the corner, though. When will it arrive? Miki: We’re just at the edge. There’s still a lot of things that need to happen before this becomes everybody’s obvious knowledge, but we’re definitely on the way. Google is developing an AI-driven assistant, for intance, that can make hair appointments for you or book a dinner for four. Dennis: There’s a saying in technology that sometimes innovations don’t go as quickly as you might expect within one year, but the world changes far more rapidly than you could possibly imagine in 10 years. These changes are coming, and the key for us is – how do we take advantage of them for our community? UVM Today: Most people know that Burlington is one of just a few cities in the world with a high-speed gigabit network. What advantages does this capacity bring to the city? Scott: The network breaks down every barrier you can possibly think of. You’re no longer a small isolated community. You’re a local community that’s part of a greater world. Entrepreneurs here have every technical advantage they’d have in San Francisco, New York or another city. It absolutely opens up every market that you can imagine. UVM Today: What role does U.S. Ignite see for networked smaller cities like Burlington in the future of technology development? Scott: We think that’s where the growth is. The key is being able to take control of your own growth and get your viewpoint across to guide where that growth goes. Midsize and smaller cities, who don’t have 20 different city councils like big cities do, have the capacity to do that. That community-focused ethos is really attractive because it’s where the entrepreneurial drive of the future is going to come from. Cities like Burlington are going to be a strong voice in how the future is shaped. Miki: For a very long time technology development has been centered in a few major hubs around the world, and specifically in the U.S. And I think is just time for it to go out and expand. We’re done with that earlier model. We can start moving out to everyone. Dennis: Burlington is the tip of a trend that is happening across the nation. A shortcut phrase for it is “the rise of the rest.” That’s the name of a particular investment initiative, but it sums up the opportunity. If you’re living in San Francisco, there’s a lot of talk that it’s no longer the place you have to be as a startup. And in fact, costs are high, traffic is bad, and there’s a lot of competition. You see more and more companies relocating to places like Albuquerque, which is U.S. Ignite city. UVM Today: How will these new technologies impact education? Miki. To me the fascinating question is really, what should we teach kids today? My 14-year-old daughter just had to learn all the state capitals. Do you know how she learned them? By asking Google Home. If that’s how you learn, why bother? Just ask the nearest device, and it will tell you the answer. Making distinctions between things the machine will know for us and the things that we need to know and employ in our lives is the hard question. I don’t think anybody has the answer. Scott: I agree. I think the future of education is about learning judgment, and not just facts. I also think tech for education holds a great promise. It can make it much more experiential, especially when you get to virtual reality and augmented reality. UVM Today: For those of us who aren’t techies, what is the difference between virtual and augmented reality? Scott: Augmented reality is just that. It doesn’t take you out of your current reality; it just adds things to it – like bringing a person from another city into your environment that you can interact with. Virtual reality is an entirely encased environment, so everything is virtual. It doesn’t pull from the real world. UVM Today: How could these technologies be used in the classroom? Dennis: A partnership that Microsoft has with Case Western Reserve is a good example. A professor there has taken Gray’s Anatomy and put it into an augmented reality model. With a pair of augmented reality goggles – the Microsoft product is called a HoloLens – you can walk through a body and take it apart and look at it, something you just couldn’t do without that kind of technology. Another application is telepresence. There’s more and more opportunity to allow a person who is remotely located to essentially come to a classroom and teach, an expert from another city or another state, for example. With a HoloLens or similar product, students would experience them as being physically there. This opens up a world of possibilities that we’re just beginning to imagine. UVM Today: In addition to the HoloLens, what other technology is emerging that could be used in an education? Dennis: I was in Chattanooga recently, another U.S. Ignite city. Chattanooga has a large school system and – like many cities around the country – an unfortunate history of segregation. Educators there are keen on giving students from different communities a chance to learn together to break down historic barriers. In the example I saw, dance teachers at two different schools used a technology called Low Latency, or LoLa, so the students could take a group dance lesson and dance together, even though they were physically separate. And what this particular technology allows them to do is to have essentially a no-delay, real-time engagement, which is what you need if you’re going to dance together. So that’s another example of something that has a practical value in education – and in larger society. Scott: Technology is going to fade into the background and just be about the things that specific students need to learn and the additional experiences that they can have. It won’t be about memorization or about the same experience for 30 students. The learning will be individualized and often virtual with someone who could be across the world. Miki: I think it’s similar to earlier education revolutions, when we moved from writing on a chalk board to PowerPoint presentations and students sitting down and using computers to take notes. This is going to be the next step. It will be things like: if all the kids are wearing devices like Apple watches that monitor your heart rate and the teacher actually has a view of the entire classroom, he can see which students feel anxious and walk over and help them. That’s one element of the kind of future were looking at. Dennis: Sometimes when technologists talk, it all sounds wonderful but also expensive, and we all know that educators are always struggling with resource levels. This technology has real value in letting school systems and teachers do more with what they have. Suddenly you can give students remote field trips or connect with people across the nation with nothing more than a virtual connection. For example, students in U.S. Ignite cities can access a very high quality microscope that’s at a university on the West Coast. And that’s a hugely expensive piece of equipment, but students have access to it at next to no cost. That’s the kind of thing we’ll be able to do, 100 times over.